With years of development and research, Level-D's 767 is one of the most amazing product releases for the Microsoft Flight Simulator platform. Now optimized and released for FSX, this is the most spectacular version of the 767 yet. A discount is also available if you have the FS2004 version of the product. Flight One Software is proud to make available the Beechcraft King Air B200 for Microsoft Flight Simulator X and Lockheed Martin's Prepar3D. The Beechcraft King Air B200 features outstanding internal and external 3D modeling, extremely realistic avionics and systems, a fully functional VC, damage and aircraft wear modeling, aircraft icing with flight model effects, accurate flight modeling, and full documentation. QualityWings, one of the industry leaders in flight simulation now brings you the The Ultimate 787™ Collection for FSX. The Boeing™ 787 Dreamliner™ is a tech marvel of aviation. Using advanced composites, fuel efficiency, new electrical designs, new engine types, the 787 ushers in the future in aircraft design. You can now expericens this airliner in FSX (soon to be available in P3D variants). Immensely popular, this well-known twin has graced the skies for over 60 years. Our 310 brings all of the style and class you would hope to find in your simulated skies, along with unrivalled flight dynamics and exquisite attention to detail. Arguably one of general aviation’s most desired light twin-engine airplanes, we are pleased to present our updated 310R Redux, completely revised and supporting a full range of simulation platforms, including FSX and Prepar3D. Carenado C337H Skymaster HD Series for FSX by Carenado. Fly the virtual skies with this great aircraft. This product includes virtual cockpit, beautiful model, and much more. Building on our experience with our award winning DHC-2 and DHC-3, we are pleased to bring the renowned DHC-3T Turbo Otter to both FSX and Prepar3D. Our turbine-engined Otter provides a nuanced flight model that closely replicates the real deal with top-notch modeling and textures, custom systems programming, and a ton of configurable options! B58 Baron for FSX by Carenado. Fly the virtual skies with this great twin-engine aircraft. This product includes virtual cockpit, beautiful model, and much more. C340II HD Series for FSX / P3D by Carenado. Fly the virtual skies with this great twin engine aircraft. This product includes virtual cockpit, beautiful high-definition model, weather radar, and much more. C208B Grand Caravan for FSX / P3D by Carenado. Fly the virtual skies with this great aircraft. This product includes virtual cockpit, beautiful model, and much more. Carenado's Cessna 172N Skyhawk II developed for FSX/P3D is the latest aircraft from Carenado that has been created with full FSX/P3D compatibility and Direct X 10 support. B200 King Air HD Series FSX/P3D by Carenado. Fly the virtual skies with this great twin-engine aircraft. This product includes virtual cockpit, beautiful model, and much more. C90B King Air HD Series by Carenado. Fly the virtual skies with this great twin-engine aircraft. This product includes virtual cockpit, beautiful model, and much more. The iFly Jets: The 737NG is a super sophisticated and complete 737NG addon for Lockheed Martin's Prepar3D. High accuracy simulation of the cockpit and systems, along with features such as ground support and push back, make this a premier expansion for P3D. The product has been tested by real NG pilots to help maintain the accuracy required for this simulation. Carenado C208B Grand Caravan EX HD Series for FSX / Prepar3d by Carenado. Fly the virtual skies with this great aircraft. This product includes virtual cockpit, beautiful model, and much more. Carenado Centurion T210M for FSX / P3D by Carenado. Fly the virtual skies with this great aircraft. This product includes virtual cockpit, beautiful model, and much more. The Ultimate 146 Collection includes the BAe146 and Avro RJ series, a four engined regional aircraft series by British Aerospace. All produced passenger variants have been included, such as the old BAe146-100, -200 and the newer BAe146-300, but also the heavily upgraded Avro RJ series. For your pleasure, every model comes with its own 2D Panel and Virtual Cockpit to fully capture the spirit and identity of these jets. The Ultimate Airliners: The DC-9 Classic and Super 80 series are an advanced simulation of the Douglas DC-9 / Super 80 aircraft for Prepar3D v4. Done in parnership with Coolsky, this product brings to you 3 of our Ultimate Airliner series into a single product. You will be able to experience the flying three different iconic aircraft which are all part of aviation history. This Carenado aircraft has been developed for FSX/P3D using all the new features FSX allows as external shadows on VC, dynamic shadows, normal mapping, especular mapping and bloom lights. SUPPORTS SP2, ACCELERATION PACK and DX10. Alabeo WACO YMF5 for FSX/Prepar3d. Fly the virtual skies with this great single-engine aircraft. This product includes virtual cockpit, beautiful model, and much more. C208B Grand Caravan Cargomaster Expansion Pack for FSX / P3D by Carenado. Requires the purchase of C208B Grand Caravan FSX / P3D HD Series. Fly the virtual skies with this great aircraft. Alabeo R66FSXP3D for FSX/Prepar3d. Fly the virtual skies with this great aircraft. This product includes virtual cockpit, beautiful model, and much more. Carenado's Cessna 152 II developed for FSX/P3D is the latest aircraft from Carenado that has been created with full FSX compatibility and Direct X 10 support. Four different models: Amphibian, Float (with and without window door), Ski (with and without window door) and Tundra. Control window for controlling eye candies (Cargo Pod, Wheel chokes, boxes%26 packages, Pitot cover, Sights prop and Tiedown ropes). This is a standalone package (It doesn´t require the C185F package). Carenado A36 Bonanza for FSX/P3D by Carenado. Fly the virtual skies with this great aircraft. This product includes virtual cockpit, beautiful model, and much more. P46T Malibu Jetprop HD Series for FSX / P3D by Carenado. Fly the virtual skies with this great aircraft. This product includes virtual cockpit, beautiful model, and much more. Flight One Software and Cessna Aircraft Company are proud to present the Citation Mustang for Microsoft Flight Simulator X, Flight Simulator X Steam Edition, and Prepar3D. The Flight1 Citation Mustang features outstanding internal and external 3D modeling, extremely realistic avionics and systems, a highly detailed set of 2D panels, a fully functional VC, and accurate flight modeling. It sets a new standard for the light business jet simulation experience. A popular choice amongst the rich and famous, the Electra was Lockheed's first twin-engine, all-metal design, taking its maiden flight in 1934. A highly modified Model 10E was made famous by Amelia Earhart, who tragically disappeared during a round-the-world record attempt. Highly evocative of the 30s and 40s, the Electra appeared in many movies, carrying Humphrey Bogart to some distant Pacific island or battling valiantly after being pressed into military service during WWII. All this nostalgia is ready-built into this new Lockheed Electra Model 10A for Flight Simulator X and Prepar3D. Designed to perform brilliantly in everything from high altitudes to Arctic conditions to the hottest climes, the 407 provides proven reliability across a variety of demanding roles. A single-engine, civil utility helicopter, the 407 is frequently used for corporate and offshore transport, as an air ambulance, law enforcement, electronic news gathering and movie making. We are very pleased to offer the ultimate in jet airliner versatility: the Milviz 737-200 Combi. Our goal with this aircraft was to successfully recreate one of the most adaptable commercial airliners ever made. We feel we've achieved that goal; the Milviz 737-200 Combi is not only highly configurable, but also includes feature rich detailing, highly detailed interior and exterior modeling, top notch textures, professionally recorded sounds and a very realistic flight model. Carenado E50p Phenom 100 HD Series for FSX / Prepar3d by Carenado. Fly the virtual skies with this great aircraft. This product includes virtual cockpit, beautiful model, and much more. The Twin Otter is truly the small airliner that does it all. There is no aircraft that can land on tarmac runways, mudflats, water, sand, snow and ice. There is also no aircraft that does regular scheduled flights in both the Polar Regions, to airports at extreme altitude, tropical islands and to a beach in the UK. And it still does all that after decades or service. It is really a remarkable aircraft. The Aerosoft Airbus products have always been highly focused on simulating the task of the Captain. The aircraft is nothing more than a `tool` for that, but to do a serious simulation of the task you need a seriously simulated aircraft. The Aerosoft A318/A319 contains all our latest developments and ideas. All the systems that are used in day to day flights are simulated with great attention to detail. This includes a Weather Radar that is a unique Aerosoft development and that is fully functional without the need for a specific weather add-on! The Aerosoft Airbus products have always been highly focused on simulating the task of the Captain. The aircraft is nothing more than a `tool` for that, but to do a serious simulation of the task you need a seriously simulated aircraft. When it was launched the Airbus 320 was a sensation. Based on a completely new concept in automation and integration and partly made from composite materials it seemed like a futuristic prototype. But airlines quickly picked up on the advantages and cost savings and the pilots started to get used to fly-by-wire and the fact the aircraft only needed 21 (!) manual actions for a standard flight. Alabeo Extra 300S for FSX/Prepar3d. Fly the virtual skies with this great single-engine aerobatic aircraft. This product includes virtual cockpit, beautiful model, and much more. C177 CARDINAL for FSX / P3D by Alabeo. Fly the virtual skies with this great aircraft. This product includes virtual cockpit, beautiful model, and much more. C195 Businessliner for FSX / P3D by Alabeo. Fly the virtual skies with this great aircraft. This product includes virtual cockpit, beautiful model, and much more. CRUZ PIPERSPORT for FSX / P3D by Alabeo. Fly the virtual skies with this great aircraft. This product includes virtual cockpit, beautiful model, and much more. Alabeo DA40 for FSX/Prepar3d. Fly the virtual skies with this great single-engine aerobatic aircraft. This product includes virtual cockpit, beautiful model, and much more. Alabeo PA36 PAWNEE BRAVE 375 for FSX/Prepar3d. Fly the virtual skies with this great crop duster. This product includes virtual cockpit, beautiful model, and much more. PA-38 Tomahawk for FSX / P3D by Alabeo. Fly the virtual skies with this great aircraft. This product includes virtual cockpit, beautiful model, and much more. Carenado PA-28-181 Archer II for FSX/P3D by Carenado. Fly the virtual skies with this great aircraft. This product includes virtual cockpit, beautiful model, and much more. Carenado C172N Skyhawk II SKI for FSX/P3D. Fly the virtual skies with this great aircraft. This product includes virtual cockpit, beautiful model, and much more. Beechcraft Mentor T34B FSX/P3D by Carenado. Fly the virtual skies with this great aircraft. This product includes virtual cockpit, beautiful model, and much more. iFly Jets: 747-400 for Prepar3d is one of the most advanced simulations ever brought to the P3D platform. Working with well known 747 Captains and Engineers, the iFly team captured the "Queen of The Skies" like never before. High accuracy simulation of cockpit and systems and a full load of features make this a premier expansion to Lockheed Martin's Prepar3d. The product was tested by real 747 pilots to help maintain the accuracy required for this simulation. Created for for FSX and Prepar3D, the MilViz Beaver combines custom programming with a nuanced flight model, a wealth of configurable options including wheels, skis, amphibious floats and tundra tires, as well as top-tier modeling and design to produce an add-on that will truly take you anywhere you want to go! Building on our well-regarded rendition of the F-4E, we didn't want anyone to think we'd forgotten about those who desire to fly 'feet wet'. Our F-4J and S models are fully carrier capable, with appropriate changes made to the models and the cockpit (only the 'S' cockpit is modelled and will be used for both aircraft), as well as to the performance envelope. Created exclusively for Prepar3D (versions 2, 3 %26 4), MilViz Corsair features an intricate flight model, in-depth system simulation, gorgeous high definition textures, an extremely detailed 3D model and last but not least, full TacPack compatibility. MilViz is excited to present to you the sleek, yet powerful, P-38 Lightning. They have faithfully modeled the 'L' version to a very high level of fidelity, simulating all of the important details that make the P-38 such a distinctive aircraft. From the suggestive rumble of it's twin 1,600 hp turbo-supercharged V-12 engines, to it's deadly "Christmas tree" launch racks laden with high velocity rockets on each wing, our P-38 Lightning is designed to closely match the feeling of the real machine. Military Visualizations original version of the T-38A Talon continues to be among the best military trainers available for your simulator. With detail-accurate modeling, rich, high definition textures, and a exquisite sound set, it is sure to offer a great flight simulation experience to all levels of pilots. Carenado PA34 SENECA V HD SERIES for FSX / Prepar3d. Fly the virtual skies with this great aircraft. This product includes virtual cockpit, beautiful model, and much more. Aerosoft / Digital Aviation CRJ 700/900 X provides the aircraft we have all been waiting for. Most flight simulator fans prefer flights that do not exceed two hours, and for a good reason. The parts of simulated flights considered “fun” are the departure and arrival. That’s why commuters are so popular with flight simulator fans. Alabeo Pitts S-2S for FSX/Prepar3d. Fly the virtual skies with this great single-engine aircraft. This product includes virtual cockpit, beautiful model, and much more. This package for FSX, FSX: Steam Edition and P3D includes the -100, -200 and -300 variants along with 12 high quality airline liveries from around the globe and combines all the latest modelling and texturing techniques with accurate flight dynamics and realistic sounds to bring you an authentic simulation of this iconic aircraft! Alabeo C188B AGTRUCK for FSX/Prepar3d. Fly the virtual skies with this great crop duster. This product includes virtual cockpit, beautiful model, and much more. Alabeo Sukhoi SU-26 for FSX/Prepar3d. Fly the virtual skies with this great single-engine aerobatic aircraft. This product includes virtual cockpit, beautiful model, and much more. Carenado C172N Skyhawk II Float FSX/P3D. Fly the virtual skies with this great aircraft. This product includes virtual cockpit, beautiful model, and much more. CT206H HD Series FSX/P3D by Carenado. Fly the virtual skies with this great single-engine aircraft. This product includes virtual cockpit, beautiful model, custom avionics, and much more. S550 Citation II HD Series for FSX / P3D by Carenado. Fly the virtual skies with this great aircraft. This product includes virtual cockpit, beautiful model, and much more. Carenado PC12 HD Series for FSX/P3D by Carenado. Fly the virtual skies with this great aircraft. This product includes virtual cockpit, beautiful model, and much more. B200 King Air HD Series FSX/P3D by Carenado. Fly the virtual skies with this great single-engine aircraft with modern glass cockpit. This product includes virtual cockpit, beautiful model, and much more. Military Visualizations is very pleased to offer you their version of the versatile MD 530F helicopter, with support for multiple platforms, including all versions of FSX and P3D. Our original rendition of the historic and beloved T-38A is, in our opinion, a standout release for our simulation platforms. Very well received, with the stamp of approval from two real world T-38 pilots, we had spared no effort in attempting to create a near perfect rendition of the real aircraft. Hundreds of hours of testing and tuning a flight model created by a respected expert, faithful recreation of both the exterior and interior models, realistic texturing, along with a quality high definition sound set rounded out what we feel is one of our best products. The Transall C-160 comes with fully working systems including pressurisation, highly detailed static elements including wheel chocks and pitot covers, 3D pilots and even a simulated discharge procedure. JSS Simulations have teamed up with Milviz/REX and the Transall C-160 comes complete with an integrated API for the Advantage Advanced Weather Radar. This Carenado C185F Skywagon aircraft has been developed only for FSX using all the new features FSX allows as external shadows on VC, dynamic shadows, normal mapping, especular mapping and bloom lights. This product is now FSX, FSX Steam Edition and Prepar3D v2, v3, and V4 compatible. Carenado B1900D HD SERIES for FSX/P3D by Carenado. Fly the virtual skies with this great aircraft. This product includes virtual cockpit, beautiful model, and much more. Just Flight and CLS - Commercial Level Simulations - now bring you the -200 and -300 versions in superb High Definition (HD) for FSX and P3D. Included is a comprehensive set of 57 High Definition (HD) liveries on 24 different models that include the Passenger and Cargo version with three different engine types along with different flight models for the different versions. 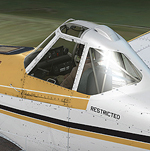 This FSX and Prepar3D collection covers the short fuselage -50 series up to the ultra-long stretched -73 series and includes three distinctive cockpit variations from the classic round-dial analogue version through a part-modernised version to the modern 'glass cockpit' variant in the later models. Venture out on new adventures or dive in and get your hands dirty with our Spray n' Play Expansion Pack for the MilViz DHC-2 Beaver! This expansion pack adds a STOL wing modification kit, straight floats, and a agricultural-focused model with a completely functional crop duster. The aircraft feature high definition 2048x2048 textures, a deployable in-flight refuelling drogue on the tanker variants, an authentic sound set from Turbine Sound Studios, and a new comprehensive 100-page manual with flight tutorial and INS guide is included. The cockpit systems and functionality of the Just Flight L-1011 TriStar have now been expanded and fully upgraded to a truly PROFESSIONAL standard! DC-10 Collection HD 10-40 has been designed to be both very high in quality but still easy to operate, providing the highest quality of model design and textures, animations and flight model characteristics at an affordable price. DC-10 Collection HD 10-40 features 19 High Definition (2048 x 2048) airline liveries and four white liveries, covering six passenger and freighter variants of the DC-10 from the -10 to the -40. A highly detailed virtual cockpit features fully modelled pilot and flight engineer positions and worn textures to produce an authentic environment. The McDonnell two-place, twinjet, all-weather F-4 Phantom II, with top speeds more than twice that of sound, was one of the most versatile fighters ever built. MilViz is very proud to present our F-4E Phantom, now with multi-platform support! This extension pack is for the Carenado CT206H Stationair. It adds the Carenado G1000 to the aircraft plus two additional liveries. By Carenado. Just Flight’s Tornado GR1 simulation is based on one of the most distinguished aircraft to have served with the Royal Air Force – ZA465 'Foxy Killer'. Following on from their award winning Canberra PR9 and L-1011 Tristar Professional, this highly detailed simulation of the Panavia Tornado GR1 was developed by Just Flight's in-house development team following comprehensive, hands-on research with the real-life ZA465 'Foxy Killer' at the Imperial War Museum Duxford. This brand-new Flight Simulator add-on is a highly detailed recreation of Daytona Beach International Airport. Fairbanks International Airport is a state-owned public-use airport. The professional version of Fairbanks lifts the scenery to a new level. This product range will contain 2 separate products: Aerosoft A318/A319 Professional and Aerosoft A320/A321 Professional. The entire scenery was optimized for high performance and with the added configuration tool the graphic details can be adjusted perfectly. QualityWings, one of the industry leaders in flight simulation now brings you the The Ultimate 787? Collection for Prepar3D v4. The Aerosoft/Digital Aviation CRJ 700/900 X provides the aircraft we have all been waiting for. FlightSim Commander is a professional flight planner, GPS, Moving Map and navigation tool. The Aerosoft A320/A321 contains all our latest developments and ideas with great attention to detail. Lynden Pindling International Airport (IATA: NAS, ICAO: MYNN) is the largest airport in the Bahamas with over 80,000 takeoffs and landings. There is no other aircraft that can land on tarmac runways, mudflats, water, sand, snow and ice like the Twin Otter. Flight1's award winning scenery product changes the entire Prepar3D ground texture and autogen world. The Flight1 Beechcraft King Air B200 featuring a G1000 equipped cockpit sets a new bar in flight simulation systems and design. The real-world GTN series 750 and 650 gauges feature fully integrated GPS, NAV, COM, and MFD functions. The GNS 430 and GNS 530 series gauges have lead the industry with multitasking, intergrated avionics and cutting edge WAAS navigation. Ultimate Traffic Live provides users over 600,000 scheduled AI traffic flights based on real airline timetables. New for version 2. We have replaced the entire road data set for the entire USA. Roads, Rivers, Streams, Bridges, Landclass, and more. The G500/G600 replaces the old steam gauges that can be found in many general aviation aircrafts with a state of the art glass cocpit. The iFly Jets 737NG is a super sophisticated and complete 737NG addon for Prepar3D. Real-world Roads, Rivers, Streams, Bridges, Landclass, Waterclass, and more is packed into Ultimate Terrain X. Roads, Rivers, Streams, Bridges, Landclass, Waterclass and more! UTX Canada V2 is a near complete rewrite of our original V1 release. The major areas covered by this scenery package include Mexico, Central America and the Caribbean Islands. This FSX and Prepar3D collection covers the short fuselage -50 series up to the ultra-long stretched -73 series. The Citation Mustang is a breakthrough combination of power, speed and true jet affordability. Certified to be flown by a single pilot. The DC-10 began its flying career in 1971 and soon proved that three engines were better than two - or four! The 747 is probably the world's most recognisable airliner and entered into service in the 1970s. The Ultimate 146 Collection includes the BAe146 and Avro RJ series, a four engined regional aircraft. So much history and a lot to explore in this ultimate MegaPack of clasic Super 80 and DC-9 aircraft. One of the most advanced 747-400 simulations ever brought to the P3D platform. FS Effects is a unique add-on for FSX, FSX Steam Edition, Prepar3Dv3, and Prepar3Dv4 that provides a more realistic flight experience. Ideal Flight Professional for Prepar3D v4: Where will you fly next? The Transall C-160 spent 50 years providing logistical support to many of the world\'s air forces.